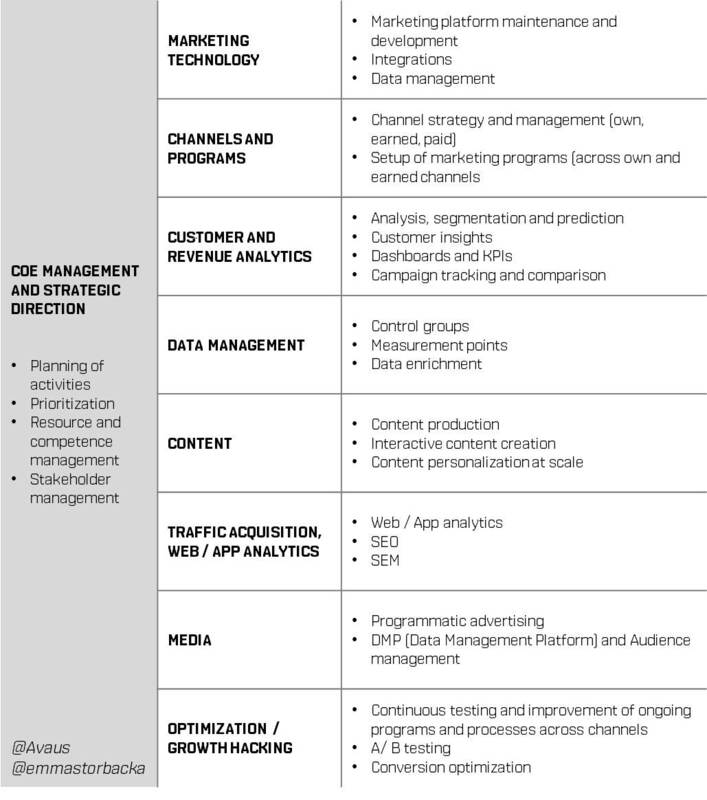 As marketing becomes increasingly data-driven and technical, CMOs see a need for centralizing marketing operations. Marketing managers have previously been able to run their campaigns and activities fairly independently, planning and implementing campaigns together with their selected agencies, mainly in external channels. 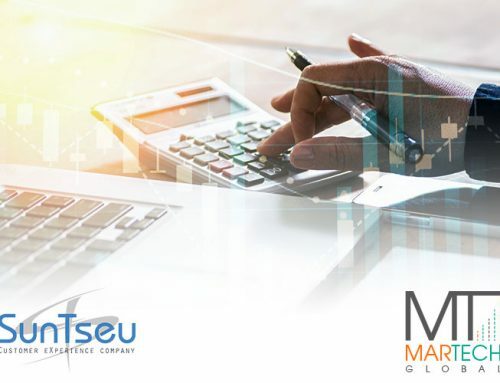 The technology landscape that most organizations choose to set up, in order to communicate 1:1 with their customers across channels, forces marketing managers to deal with the complexity of data, technology and the multitude of content variations that a data-driven approach requires. An increasingly technical, and hands-on approach is required to run everyday marketing operations. Having the required technical competence spread across the company is simply not efficient. 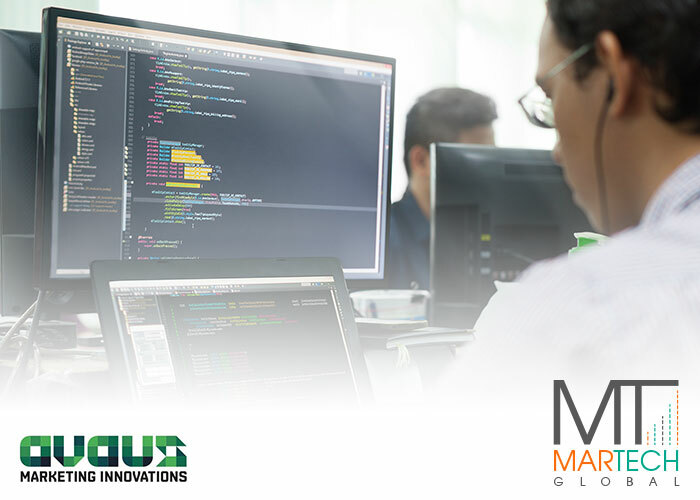 Therefore large corporations such as Xerox have centralized parts of their marketing functions into regional Centers of Excellence, typically focusing on servicing their business with marketing technology, data management, and operations of multi channel programs. For the same undisputed reasons that the IT function needs to be centralized (security, scalability, cost efficiency) you don’t want to run Marketing as a decentralized, independent ad-hoc organization anymore. And for the same reasons, allowing a multitude of different agency partners dealing with data-driven marketing topics is not a preferred option – centralization and pooling of service providers is another task on the to-do list of marketing executives today. What is a Marketing Center of Excellence (CoE)? The challenge – how to approach building a CoE? For most large organizations, building a CoE mean in the first hand pooling the existing resources and creating a formalized central organization if that does not yet exist. Thus, identifying the team members able to work in this new, technically more challenging landscape is of of the first things to tick off your list. After that, training and revamping the know-how of those marketers becomes key, as it is a process that will take at least 12-18 months – learning on the job is also a key element. However, typically most marketing organizations do not have the required competencies in-house, and will need to either recruit, insource or outsource part of the CoE functions / roles. 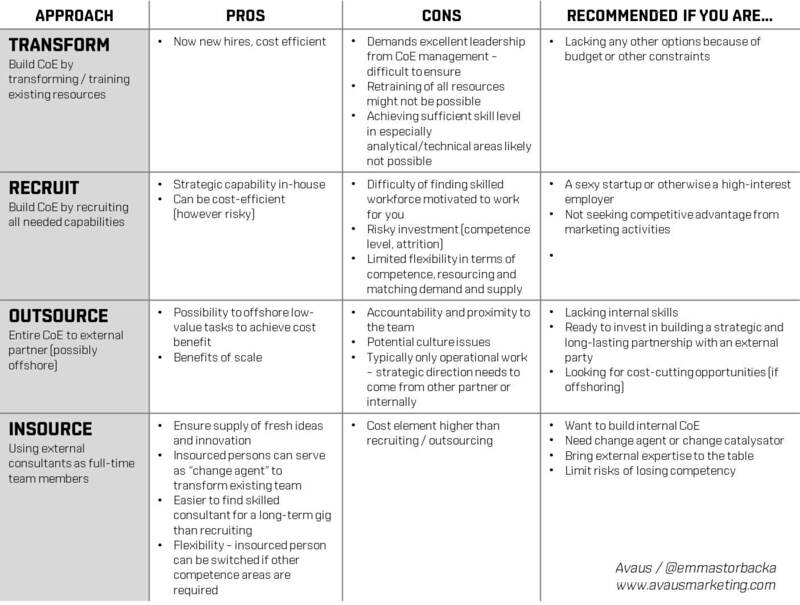 The different approaches for building a CoE are detailed in the chart below, with Pros and Cons listed for each, and a recommendation for which organizations should choose which option. There are pros and cons of every solution. Naturally, the preferred option will be a hybrid of several approaches. Handpicking the trusted skilled employees from the current organization, recruiting additional ones, strengthening the transformation journey with insourcing key strategic competencies and outsourcing bulk production might be the perfect answer. For companies facing the possibility of building the CoE from scratch, the optimal structure would likely be a hybrid between recruiting and insourcing, where the share of insourced support will go down over time, transforming towards an outsourcing model – once bulk tasks are identified and a process for efficient production has been defined. Marketing (automation): So what about the channel?